Frank L. and John W. Fenton opened their decorative glass company in 1905. Initially, the company purchased plain glass from other manufacturers for painting at their facility in Martins Ferry, Ohio. Later, the company moved to Williamstown, West Virginia, where they began producing their own glass on January 2, 1907. It was around this time that Frank Fenton introduced iridescent glass -- the art glass we now know as "carnival glass." Carnival glass production halted during the Depression and didn't resume until 1970. Other makers of carnival glass include Dugan/Diamond, Northwood and Imperial. Confirm that the piece of glass has an iridescent sheen -- a rainbow colored gloss that has been compared to an oil slick on water. If the item does not have iridescence, it is not carnival glass. Examine the iridescence on the piece of glass. In a true vintage piece of carnival glass, the colors are more vibrant. 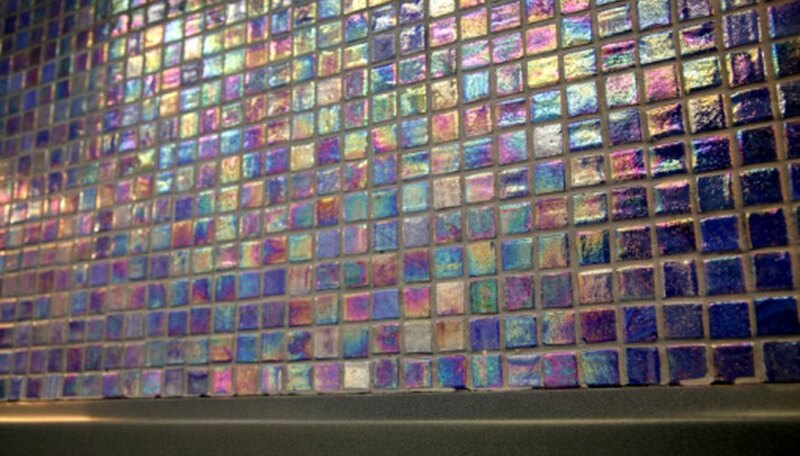 If the underlying color of the glass is a pastel shade, the iridescence will be correspondingly lighter. Determine the color of the glass itself -- that is, the underlying color. By looking at the base of a piece of carnival glass, you can tell the color of the glass beneath the iridescent coating. This is one of the best ways to authenticate a period piece of carnival glass because the original pieces weren't iridized on the bottom. Look at the base of the piece for straw marks, which are lines that occurred during the molding of the piece of glass. They do not detract from the value of the piece and, in fact, may help to identify it as a period item because such marks were common in the carnival glass of the early 1900s. Take care when cleaning carnival glass because it is very fragile. Use dish soap with room-temperature water and a soft cloth. If the piece has sediment in the bottom, use a tablet or two of denture cleaner to remove it. Dry the piece carefully with a soft cloth prior to displaying. Avoid drastic temperature changes for your piece of carnival glass. Sudden temperature changes can cause internal flaws to expand, leading to breakage. Don't leave your carnival glass pieces out in direct sunlight as doing so can cause fading of the iridescence.